Prologue welcomes you to the era of worry-free concrete pours. To make the process quick and painless, we have compiled the following guide. Please ensure they are valid and accessible and have known offset values. We'll use these offsets to align the scanned field conditions over the architectural plans. We prefer to scan just a few days before the pour. We provide next business day turnaround to get you results, and allow enough time to make necessary alterations. 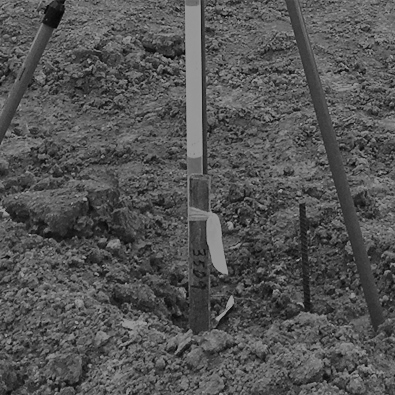 Debris, piles of backfill, equipment and activity within the area of the pour make for challenging scanning and distracting clutter on our deliverables. Provide Prologue with CAD line work to compare against installed components. PDFs are not accepted, as they get too grainy at high zoom levels. Provide at least one detailed view of the building section at the slab level for each unique wall type. This may be in PDF form. Communicate the big picture for your project. The more we know, the better the product we can deliver. Include Prologue on your subs/trade distribution lists so we are aware of schedule changes, announcements and site-wide communications. Provide a long-range plan for the pour schedule. Dates may change, but we still like to book your scanning dates in advance to ensure availability. Tell us about any site requirements, trainings, certifications or non-routine PPE required. Protect any and all building corner offsets or other survey controls. While other subs may no longer need them, they are critical to a successful and timely ReadySet. Drive stakes beside them, wrap them in caution tape, or stack blocks around them—just ensure they remain in place and undisturbed until scanning is complete. We also prefer to have at least one benchmark to establish an elevation that relates to FFE. The slab should be as close to pour-ready as possible when we scan. We are not responsible for rough-ins that move due to on-site activity after our scanning is complete. An activity-free site allows for a superior deliverable. While we can work around most anything, foot traffic or excess debris on-site can delay our results. Unless we drop by the trailer to say hello, you may not know we came and went. Prologue crews are instructed not to interfere with other trades or subs and we demand professional courtesy of our staff. From time to time, we may scan before or after hours when activity on the site is low. If there are limitations to working hours, please let us know. Once we capture field data, our crews return to the office. There we prepare the data to be overlaid by the line work. We strive to provide the deliverable by the end of the following business day. If you have any special requests, please don’t hesitate to ask. If you would like to have a copy on hand, click here. If you have any questions about ReadySet, please feel free to reach out by clicking the button below or give us a call at 804-675-2414.